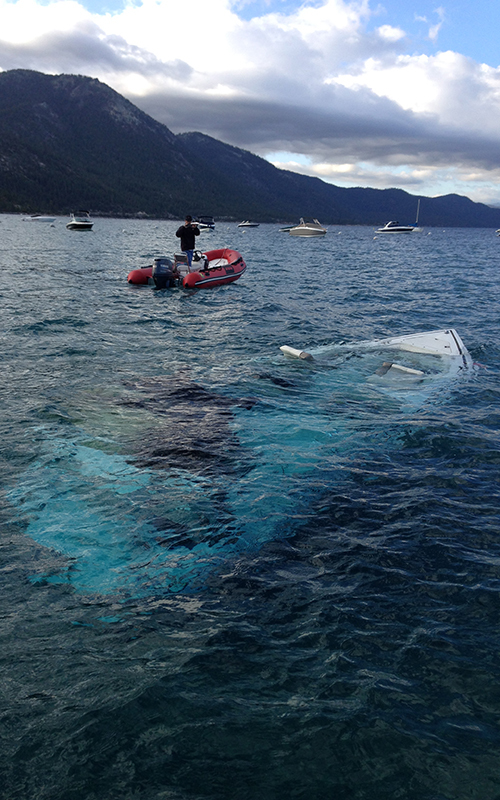 Lake Tahoe’s B.J.’S Barge Service is your Lake Tahoe buoy maintenance and boat salvage specialist. We do annual inspections, Chain Replacements, Buoy Float Replacements, New Mooring Installations, Custom Mooring Lines, Buoy Field Realigning, Lake Water Pumps and Boat Salvage. B.J.’S Barge Service has been serving Lake Tahoe for nearly 40 years. Before you launch your boat and deliver it to your buoy make sure to call B.J.’S Barge Service and have your buoy inspected so you can enjoy the boating season at Lake Tahoe. No other lake can compare to Lake Tahoe for beauty and clear water. 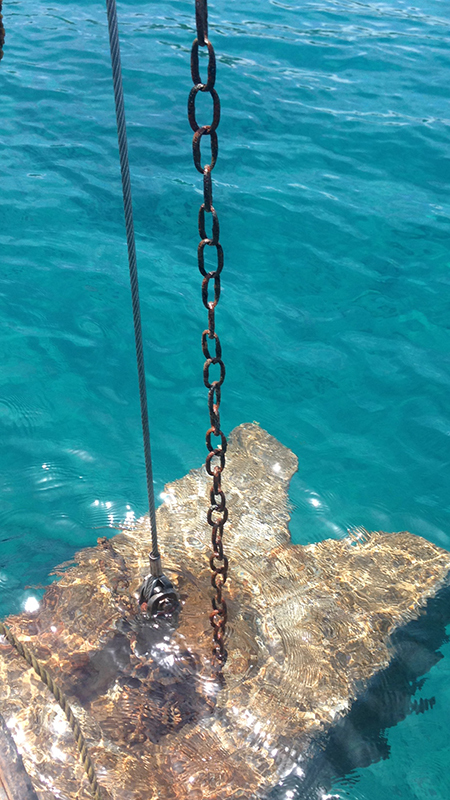 You may think all is good when you hook up to your buoy but when you look down at you’re mooring chain you are only seeing what is near the surface. Most of the wear happens at the bottom where the chain has been moving across the sand and rocks all year every day all day long. So call B.J.’S Barge Service for all your mooring buoy needs. We have the most experience and knowledge on Lake Tahoe to give you an expert opinion. Why Get an Annual Mooring Inspection? Chain is cheaper than a boat, so don’t gamble make sure you are on our inspection list and call 530-525-5129 or email bjbarge@att.net to confirm that your mooring buoy inspection or buoy work has been completed. We will be happy to be of service to you. Keep your boat and surrounding boats safe. Prepare accordingly and have your mooring buoy inspected, remove and replace worn chain if needed, replace waterlogged or cracked floats with new floats, add anchor weight (buoy block) if needed and always have a good mooring line that is activated securely. Being prepared includes your first boat equipment pre-check. Have a working VHF radio or mobile phone on board, make sure horn is working, life jackets for all persons and do not forget the kids and infant size PFDs (personal flotation devices) and a throwing flotation device. Fire extinguisher gauge needs to be in the green and have B.J.’S Barge Service inspect your mooring buoy chains. These are some of the equipment checks for your boat. B.J.’S Barge Service recommends inspecting your buoy annually and have a quality made mooring line, “so you can sleep at night”. If you have been boating Lake Tahoe for a while you have seen calm water in the morning and calm water in the afternoon. Then you have seen it go from calm water in the morning to white caps and gale force winds in the afternoon. Being caught in a summer storm on Lake Tahoe can be a frightening experience. Being prepared for boat outings on Lake Tahoe will add more enjoyment to your summer plans. Homewood, California 96141. Our Home Port is Obexer’s Marina. ©2016 Tahoe Boat Salvage & Buoys.